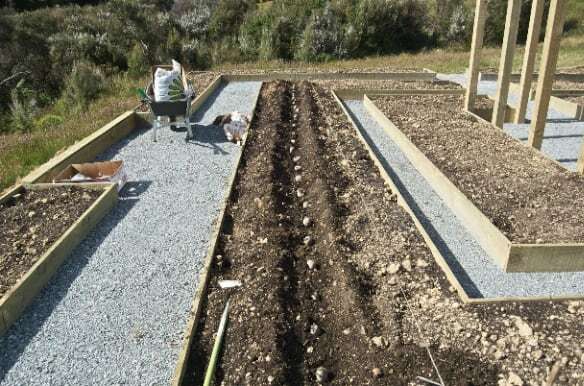 The challenge for kiwi gardeners is to have fresh crops from the garden to serve on Christmas Day. 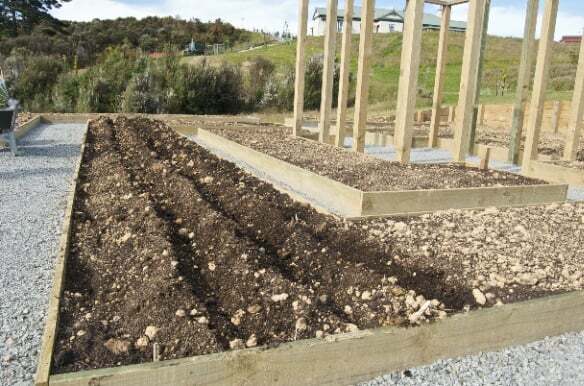 For me the challenge has been simply planting vegetables to grow before the big day. I managed to get our first potato crops in the ground on Christmas Eve. 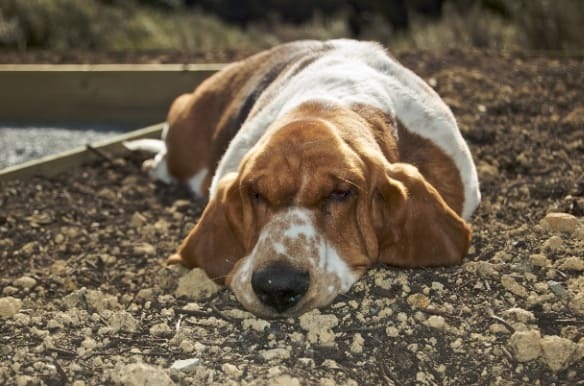 At this stage the bassets were taking refuge in the shade of the wheelbarrow. 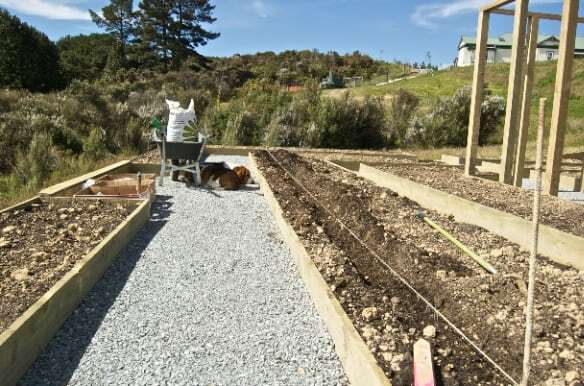 Certainly no help from them as I laid out 3 rows – Rocket (earlies) with Desiree and Agria (main crops). I followed the trench methodology laying plenty of sheep pellets to help feed the soil. I’m investing in some new long handled tools for future although it’s good to get close to work the ground for the first time. The rows are not the straightest in the world but Mason abandoned his post holding the string and lay out his belly for some sunshine instead. That dog has no inhibitions. Fortnum doesn’t like the heat at all and found a much cooler place to hide. This is a dog that loves long grass. After two hours there were 90 seed potatoes carefully planted and watered in. The earlies should start cropping in 10-12 weeks (about time for Easter!) and the others 12-24 weeks. At the end of all his efforts Mason has declared his favourite spot and now resolutely refuses to sit or lie anywhere else when we’re down in the kitchen garden. The battle of wills has commenced. 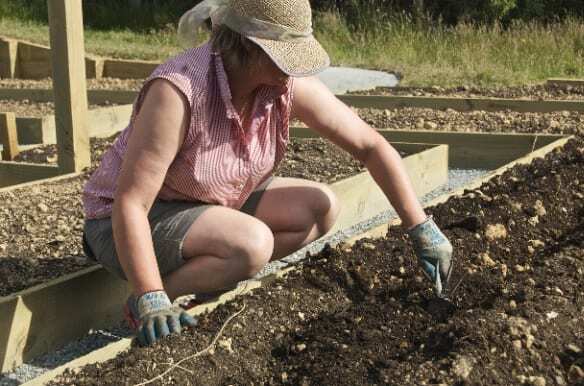 Planting the potatoes was certainly the easiest step to getting planting under way. When they should be planted and harvested. After all the basic research I’ve ended up with a plan that looks something like this. 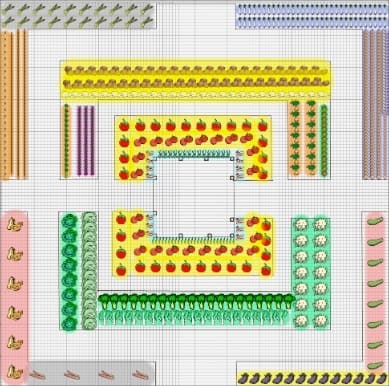 This plan was generated by a nifty on-line planner called Grow Veg.com It allows you to pick which vegetables you want to grow and then automatically calculates how may plants can fit in the space. To make it easy it also produces a growing plan telling you when to plant and harvest your crops. It’s saved me heaps of time and effort using this planner. Now all I need to work out is how to I stop little basset frequenting the onion bed! Previous Post: « How are your holiday biorhythms? Wow that planner is an awesome tool! When a timely find. Enjoy planting it all out. Wow. That’s gardening on a serious scale! 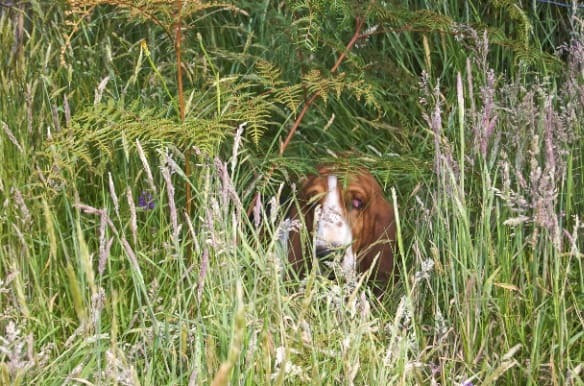 I’m afraid in levels of industriousness, I’m probably more aligned with your bassets than I am with you. Merry Christmas and I hope you have a fantastic 2010. 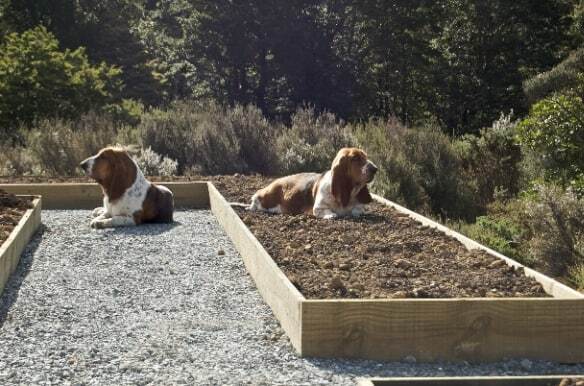 Seems to me that them thar pooches are just letting you know where your gardening comes in the pecking order. Love the chart looks a bit like an American quilt pattern, are you going to feed the neighbourhood with all those potatoes. Seriously, I am extremely impressed with all this manual activity.